The collection is comprised of an eclectic mix of Paintings and Drawings and Sketches in Pen and Wash, covering a period of more than 47 years. It also includes, Personal Letters, Social Notes, Bills, reports to publishers, sample medallions, a letterbox painted in oils and a range of printed articles, penned by Harrison Weir. There are even some printers blocks, showing the artists signature “in situ”. All of the letters are autographed and some of the books in our library are also autographed and/or numbered by his hand. All these items were purchased as part of our ongoing research for a book about the life and passions of Harrison Weir and now form the core of the Harrison Weir Collection. Original Pencil Sketch of a Donkey, signed and dated 1899 with the notation “for a picture”. One of several drawings in our collection, which also includes some sketches/cartoons in pen and wash.
One of a pair of Original Water-Colours, both signed and dated 1855. This one is entitled “The Rise” and was possibly exhibited at the British Institution before being sold to an American buyer. It is still in its original frame and mount. A sampling of three letters from three periods and three different addresses. At left, a letter written from Peckham in Camberwell, at centre.. a letter to William Harnett Blanch, written from “Weirleigh” in Brenchley, Kent. At right, a letter written from Sevenoaks. Floor Plans for the existing house and new extensions at Weirleigh, in Brenchley Kent, designed by architects Wadmore & Baker and appearing in the April 9th supplement of The Scientific American. 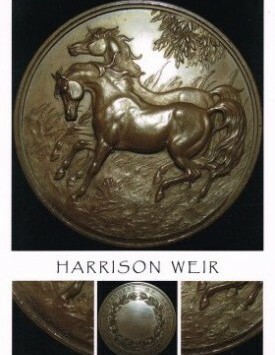 Bronze medallion, circa 1862, a commemorative award from the Government of India Horse Show. Designed by Harrison Weir for J.S. & A.B.Wyon, official sealmakers to HM Queen Victoria. Letter dated 26th December, 1893, written from Iddesleigh, Sevenoaks. 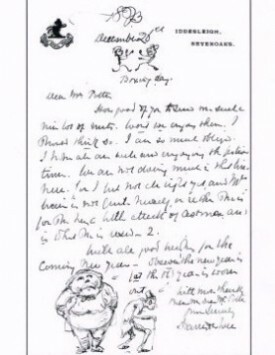 To Mrs Potter, thanking her for her festive gift of nuts etc..This letter also contains several delightful little cartoons, representing Boxing Day, and the Old and New Year. 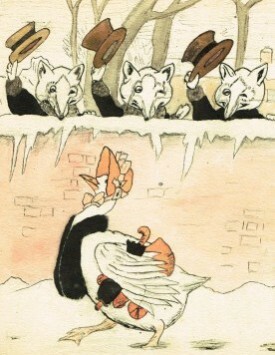 Excerpt from an original humourous rendering in Pen and Wash, of Mother Goose out shopping, being acknowledged by three “toffs” in the form of foxes. Circa 1904. Able to view and compare side by side, this scan from the Original Water-Colour by Harrison Weir, of “The Rise” dated 1855 and a steel plate engraving of the same by E.Hacker in 1856. A very detailed steel plate engraving of the same painting, by E.Hacker. This image appeared in the October 1856 issue of Sporting Magazine under the heading of “Pheasant Shooting”.